Published by James Webster, No. 24, South Eighth Street [etc. ], Philadelphia, 1819. Sweet & Maxwell Limited [and] John Wright & Sons Limited, London [and] Bristol, 1961. Printed for John Anderson, Medical Bookseller [etc. ], London, 1825. 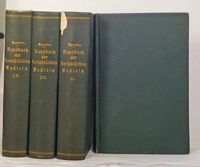 The first English edition of Beck's most important work, "the first authoritative book on medical jurisprudence published in the United States", reaching a twelfth edition later in the century--"remarkably comprehensive [and] clearly . . . written"
Printed by Henry B. Ashmead, George Street above Eleventh, Philadelphia, 1855. The Forensic Science Society, London and Harrogate, 1970-75. Banks & Brothers, Law Publishers, No. 144 Nassau Street, New York, 1866. F.C.W. Vogel [and] Springer-Verlag, Leipzig [and] Berlin, 1930-1978. Verlag der H. Laupp'schen Buchhanlung, Tubingen, 1881-82.